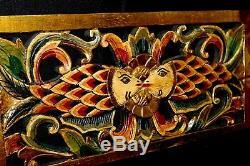 Balinese Twin Fish Panel Architectural Relief Wall Art Hand Carved Wood red 23L. Carved Balinese Architectural panel in the Traditional Balinese Fish motif. Panels like this are used to adorn doors and windows all over the island of Bali. This piece is carved from jempenes wood and painted with rich colorful detail with shades of rich green, reds & creams with an antique wash.
(please note that computer monitors my display colors slightly differently than actual piece) Embellished with gold leaf. This is a stunning work of art. Group more than one together from our selection of Balinese wall panels in our store for unique wall art! Over a window, couch or bed. This unique piece of Balinese handiwork is sure to add beauty & serenity to your home where ever you choose to display this magnificent carving. Will add architectural interest to any home! Each panel is hand carved especially for us by the talented artisans of Bali. Because of this each panel my vary slightly in coloration & carving. Sizes also may vary slightly. This is normal and not a defect, but a reflection of the hand crafted nature of our product. Size: 23" long 10.5" wide 3/4 thick. Ships FAST from our location in the USA. Since 1988 we have ethically sourced and hand picked our products directly from the artisans and craftspeople on the back roads, family compounds and markets of Bali and other Indonesian islands. Our shop in Downeast coastal Maine offers an ever changing kaleidoscope of Balinese folk art, Buddhist & Hindu art, stone garden statuary, wood carvings. Traditional mask, mermaids, winged mobiles, architectural finds, antiques, home decor treasures, batik clothing & silver jewelry and so much more. To view our entire collection of Bali Art, home decor & unique finds! 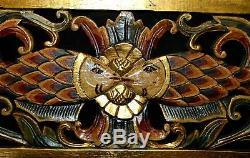 The item "Balinese Twin Fish Panel Architectural Relief Wall Art Hand Carved Wood red 23L" is in sale since Wednesday, July 27, 2016. This item is in the category "Collectibles\Cultures & Ethnicities\Asian\1900-Now\Indonesian".